Electronic music on a distant planet is the somewhat strange theme of this online slot from Foxium; it’s called Astro Legends: Lyra and Erion and the oddness of the concept is matched only by the intriguing gameplay – read all about it below. Astro Legends plays out on the shape you can see in the screenshot above and the aim is to land at least five connected matching symbols to win prizes; a sparse, desolate landscape forms the backdrop to the gameplay while Lyra strums her instrument on the left hand side. There are just six standard symbols – a garnet, an amethyst, a peridot and then Q, K and A struck into rock. 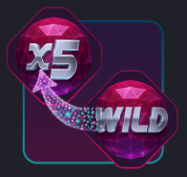 The wild symbol can only appear in the three pink-edged positions on the reels and when it contributes to a winning combo it will apply a multiplier of up to 5x. This may occur randomly after a win in the base game and all those symbols involved will be locked in place; Erion will emerge from his hole and block all other reel positions after which Lyra will blast them all away – if there are any matching symbols will improve the win another respin is awarded. The bonus ends when there are no more matching symbols. Occasionally a bubble shaped as a star will float onto the reels to be popped by Lyra, the value which emerges (between 2 and 10) will be added to the total in the top left hand corner. 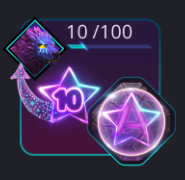 When the total reaches 100 the Lyra Spirit Bonus starts and Lyra turns into a wolf; you must select one of three tracks for her to run across, avoiding rocks placed by Erion and picking up gems which will increase the multiplier for any wins. Making it through 7 levels or losing all three lives will end the round and any remaining lives will add a 20x multiplier to the total prize. Astro Legends looks great and it comes with an interplanetary soundtrack to match; it doesn’t take too long to collect the Stardust to trigger the main feature and that’s where the biggest wins are. This game comes with an RTP of 96.63%.